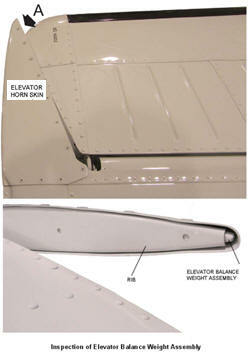 August 20, 2013 - The FAA has issued an airworthiness directive (AD) on certain Beechcraft aircraft as a result of reports of elevator balance weights becoming loose or failing because the balance weight material was under strength and did not meet material specifications. This AD requires inspections of elevator balance weights and replacement of defective elevator balance weights on models 58, 95-C55, E55, and 56TC airplanes and Hawker Beechcraft Corporation Models 58P and 58TC airplanes. The AD becomes effective September 24, 2013. The FAA reports if left uncorrected the affected aircraft could experience reduced flutter speed and control loss of the elevator. It is estimated that over 1,300 U.S. aircraft will be affected by this AD at a cost of just under $1,000 (Replacement of elevator balance weight 1 work-hour × $85, parts cost $300 and cost per product $385). Before further flight after September 24, 2013, the effective date of this AD and thereafter at intervals not to exceed 100 hours time-in-service (TIS) until the replacement required by this AD is done, inspection must be done on the elevator balance weights for looseness, failure, and/or working (smoking) fasteners and inserts. Special flight will be permitted with the following limitations: Maximum structural cruising speed (V no) = Design Speed for maximum gust intensity (V b) = 195 Knots Calibrated Airspeed (KCAS), or V no=V b=195KCAS. This special flight is not allowed into known turbulence, and the duration of this flight should not be more than a total of 10 hours TIS. Effective September 24, 2013 elevator balance weight assemblies P/N 96-610022, P/N 96-61022-5, P/N 96-610022-7, and P/N 96-610022-9 elevator balance weight assemblies, if originally purchased from Hawker Beechcraft Corporation also known as Raytheon Aircraft Company or Beechcraft Corporation between January 1, 1996, and December 31, 2005, may not be installed on any aircraft. Back in October, 2011 Beechcraft issued a service bulletin on Model 58, Baron, Serial numbers between TH-1768 through TH-2110. Baron Model 58, 58TC, 58P, 95C55, E55, or 56TC requiring inspection of the elevator balance weight assembly every 100 flight hours or until replaced.